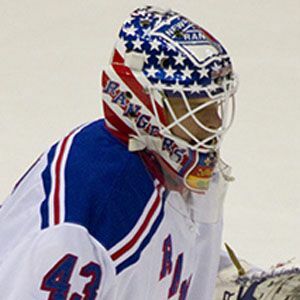 Canadian goaltender who became the fourth player in NHL history to skate for all three teams based in New York state. He played in the Quebec Major Junior Hockey League before being drafted in the first round of the 1995 NHL Entry Draft by the Buffalo Sabres. He shared the Harry Hap Holmes Memorial Award with Tom Draper in 1999. His younger brother Mathieu became a player in the Deutsche Eishockey Liga (German Ice Hockey League). He became goaltender of the Buffalo Sabres after the team lost the great Dominik Hasek to free agency.